(Last Updated : 16.02.19). Download Rajasthan Public Service Commission (RPSC) Admit Card and Exam Schedule 2019 for the post of School Lecturer and Senior Teacher Grade II (Sec. & Sanskrit Edu.) Exam 2019 under Secondary and Sanskrit Education Department, Rajasthan. The School Lecturer Exam 2018 will be held from 15 July 2019 to 25 July 2019 as per the schedule. Candidates can download School Lecturer Admit Card 2019 from the official website of RPSC as and when the Exam Roll No. are available on the website. Here is the written test schedule and admit card latest updates 2019. Here is the written test schedule and admit card for School Lecturer and Sr. Tr. Grade II Exam 2018. Written exam will be held as per the schedule. Mock Test link for Online Exam February 2018 for Sr. Teacher Grade II Exam 2015 was available as per the schedule. Candidates were advised to online practice for mock test held in 2018. Here is the link. School Lecturer Exam 2018 Admit Card 2019 can be downloaded from the official website of RPSC i.e. www.rpsconline.rajasthan.gov.in. The Admit Card will be released by the Commission as per the schedule and candidates can download their Hall Ticket from the official website as and when the admit cards are available officially. RPSC (on 25.01.18) uploaded link for Admit Card and Online Exam Briefing for Sr. Teacher Grade II Exam 2015 as PPT & Video by Court Orders. Here are the links for RPSC Online Exam Briefing for 2nd Grade Teacher Exam to be held in 2018. Here is interview schedule and interview letter for College Lecturer Exam 2015-16. 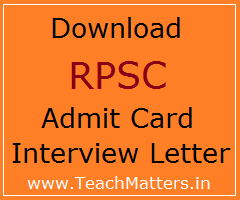 If any candidates does not get his/her interview admit card, he/she can download the interview admit card from the official website of RPSC i.e. www.rpsconline.rajasthan.gov.in.